You know this thing about Counterfeit Cat Games? Counterfeit Cat Games is an interesting category appeared in exclusivity here on our site, a category inspired from a new Disney XD animated television series where you will get a lot of challenges for both girls and boys. In Counterfeit Cat Games you can find 1 games that we've published for these kids and childrens that are interested to play Counterfeit Cat Games, this game gategory have been created on 29.05.2017. These games with Counterfeit Cat Games have been voted 1 times and the avarage of vote is 5.00 stars. We advice you to play the last flash game from Counterfeit Cat Games, Counterfeit Cat Nine Lives that have been published on 28.05.2017 14:00. 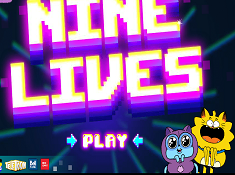 Counterfeit Cat Nine Lives its a part of Counterfeit Cat Games category and until now its played 1058 times. Try it now on Cute-Games.com! If your like the Counterfeit Cat Nine Lives game you can write a comment in the game page. Recommend this game to your friends if you like it! Find More About Counterfeit Cat Games! Counterfeit Cat Games is something brand new appeared on our site where you have a lot of challenges for girls and boys. Here you will get a lot of games with your heroes from cartoons, I am sure you can find something you like. In this cute category you will have the chance to interact with your heroes from Disney XD, Max and Gark. If you do not know anything about the new Disney XD show I will tell you its plot to find out about the main characters and I am sure I will make your curious. After you play these games with Counterfeit Cat I am sure you will want to watch the animate television series. The main character from the show is Max, a cat who lives with his owner, an old lady. Gark is an alien who lands on Earth in Betty`s laundry. He finds a nice place to live and he is going to disguise in a cat to fit in on the new planet. He is going to live with Betty and Max. Max and Gark are going to become best friends. Gark has a lot of super powers and he does not know how to control them very well so a lot of problems appear. They have a lot of adventures and they always get in trouble. I am sure you will have fun watching Gark and Max in their adventures. Max tries to use Gark`s powers for his own interests but he always fails. Max is very greedy and GArk always listens to him. We are going to bring you a lot of interesting games in the Counterfeit Cat Games category so I am sure you can find something that you like. We have some puzzle games for you in this category where you can see images taken in exclusivity from episodes. There you can see Max, Gark and other characters from the show. THe most important thing in this type of games is to be fast if you want a big score because you will get points according to the time you need to arrange the pieces. You have to press play to make the pieces mix and then you have to do your best to put them in their place as fast as possible. Max and Gark trust your skills so you should do your best to prove them how good are you with puzzles. Let us know which is your favorite game from Counterfeit Cat Games category and we will bring you more games like that one. Here you will get all kind of games, I am sure you will find something that you like. We have 10 new games on our site every day and new categories every week, I am sure you will be surprised. Here you have also a memory game with Max and GArk where you have a lot of cards with images with your heroes from cartoons. Give us a like if you had fun playing games with Counterfeit Cat and a g plus to promote this category for all the kids who love the new Disney XD animated television series. Max wants to use Gark to entertain himself but he always gets in trouble after that. Gark has a lot of fun on Earth. He is disguised in a cat and Betty believes him because she is just an old lady. In all the games from this category you should have fun because this is the most important thing on our site, for you to have fun. In the second place you should focus all the time to get a big score if you want a chance on the podium. There you will be only with the best players in the world. If you play these games you need agility, attention and ability. Be persistent and I am sure you can make a great job and Max and Gark will be proud of you. If we see that you enjoy these games we are going to bring you more. Try them all to find your favorite game with Max and Gark, the main characters from the show. Let us know what kind of games you like the most and what categories you want here on our site and we are going to do our best to bring them to you because we want to make you happy, satisfied with our site, the best games site in the country. I am sure you will have fun with Max and Gark here in this category where all the challenges include them. Some games are easier at the beginning than as you progress in higher levels so do your best to complete them all, do not hurry to underestimate them. Try again if you can not handle the challenges from the first attempt and I am sure you can do better.